When the New York Giants drafted Saquon Barkley in the 1st round of the 2018 NFL Draft, many pundits and fans believed the Giants now had the best RB-WR-TE trio in football in Barkley, Odell Beckham, and Evan Engram. After all, despite a bad case of the dropsies, Engram was coming off an impressive rookie season in which he had led the team in receptions and touchdowns despite often being the center of the opposing defense’s attention. 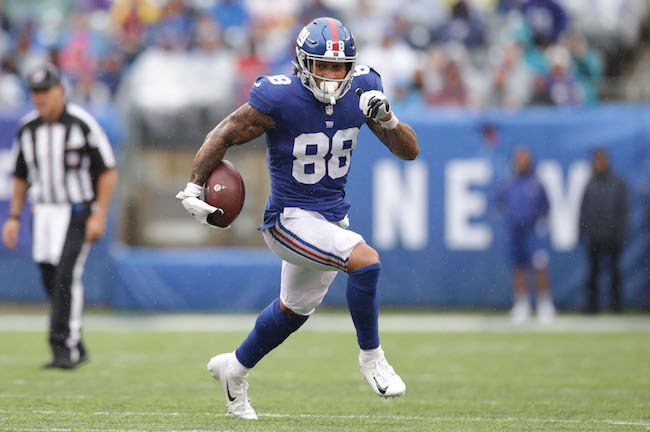 It was thought that the return of Beckham from a serious injury that had caused him to miss most of the 2017 season, and the addition of the explosive Barkley, would leave Engram in many extremely favorable one-on-one match-ups. However, Engram significantly regressed in the first half of the 2018 season. Whether it was due to a knee injury that caused him to also miss three games before the bye week, or the learning curve between the new coaching staff and the second-year tight end, Engram was a virtual non-factor in the passing game until November. Through the midway point, Engram had only caught 17 passes for 145 yards. Worse, Engram’s size and power limitations as a blocker were ill-suited to a team looking to focus more on the ground game and Saquon Barkley. It began to look like team and player were mismatched. Things changed after the bye despite the fact that Engram missed two more games, this time with a hamstring injury. It was not so much the improvement in receptions from 17 to 45, but the number of big plays Engram began to make. There were two 50+ yard run-and-catch gains and a number of 30+ yard receptions. This was the type of explosive impact that had been expected all year. Rhett Ellison actually saw more on-field action than Engram in 2018. Ellison played in 54 percent of the team’s offensive snaps, while Engram saw the field 46 percent of the time. Ellison’s numbers were very similar to his initial season with the Giants, catching 25 passes for 272 yards and just one touchdown. Unfortunately, his blocking was inconsistent and not up to the level one would expect from a supporting-cast-type tight end. The surprise player was Scott Simonson, a no-name tight end signed from the Carolina Panthers in June. Simonson played in 28 percent of all offensive snaps. And while he only had nine catches, at times, Simonson appeared to be the team’s best blocking tight end. Overall, it is fair to say that more was expected from this unit because more was expected from Engram and Ellison. Engram began to redeem himself in the second half after his horrific pre-bye play. Ellison still has not lived up to his 4-year, $18 million contract. It was a tale of two seasons for Evan Engram in 2018. Before the bye week, Engram missed three games with a knee injury and caught just 17 passes for 145 yards and two touchdowns. After the bye, Engram missed two games with a hamstring injury, but his productivity increased to 28 catches for 432 yards and one touchdown, with a number of game-changing plays. The Giants drafted Engram in the 1st round of the 2017 NFL Draft. Other than too many dropped passes, Engram had a very solid rookie season for the Giants in 2017, playing in 15 games with 11 starts, and finishing with a team-high 64 catches for 722 yards and a team-high six touchdown receptions. Engram is not built like a traditional tight end, more like an H-Back/wide receiver ‘tweener. The strength of Engram’s game is catching the football. He creates mismatches because of his combination of size and athletic ability. Engram is quick and fast. He runs good routes and is a natural pass receiver with a good catch radius. While Engram works hard at his blocking, he lacks the frame to ever be a significant factor as an in-line blocking tight end. Rhett Ellison’s 2018 season was remarkably similar to his 2017 campaign, catching 25 passes for 272 yards and one touchdown. Ellison was originally drafted in the 4th round of the 2012 NFL Draft by the Vikings. He suffered a serious patellar tendon injury in December 2015. The Giants signed Ellison as an unrestricted free agent in March 2017. The 6’5”, 255-pound Ellison is versatile, having the ability to play tight end, H-Back, and fullback. While Ellison lacks ideal speed and quickness, he is a very sure-handed receiver who runs good routes. He is an adequate-at-best blocker. Scott Simonson had his best season in 2018 after being signed by the Giants in June 2018. Simonson played in all 16 games with four starts, finishing with nine catches for 86 yards and one touchdown. The 6’5”, 255-pound Simonson was originally signed as an undrafted rookie free agent by the Oakland Raiders after the 2014 NFL Draft. The Raiders waived him in June 2015 and he was then signed by the Carolina Panthers. He spent all of 2017 on Injured Reserve with a back injury. Simonson has played in 34 regular-season games with five starts. He had one catch in his NFL career before 2018. While he does not excel at either, Simonson can block and catch. The Giants signed undrafted rookie free agent Garrett Dickerson in June 2018. He spent a couple of stints on the team’s Practice Squad and 53-man roster during the year. Overall, Dickerson played in four games with no starts and did not have a catch. The 6’2”, 244-pound Dickerson is a versatile player who can play a variety of positions including tight end, fullback, and H-Back. Though he lacks ideal size, he is a good athlete with fine hands.